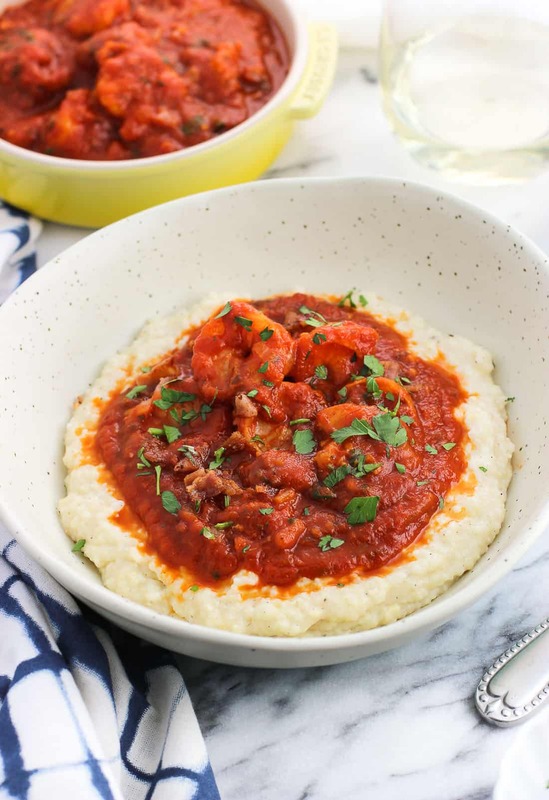 Shrimp fra diavolo and grits is an Italian take on a classic Southern dish. This spicy shrimp and grits recipe features bacon and quick-cooking shrimp in an easy sauce, all served over Parmesan grits for an updated version of comfort food. Much like banana pudding, shrimp and grits was not a meal I ate growing up. I don’t think I even ate grits up until a few years ago! Better late than never I suppose, because shrimp and grits was one of those meals that wowed me when I got around to trying it. Creamy grits, perfectly sauteed shrimp, bacon (! )…what’s not to like? 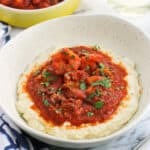 Since I rarely leave well enough alone when it comes to classic dishes, I started amping up the spice when I made it at home, which soon transformed into this shrimp fra diavolo and grits recipe. 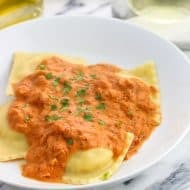 You have a just-spicy-enough tomato sauce that’s easy to make from scratch, but tastes fancier than you might think. Then there’s the shrimp that cook in bacon grease, which is equal parts efficient and delicious. And then the grits, with their hefty dose of Parmesan. 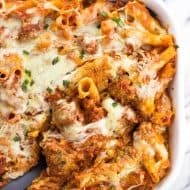 Italian meats Southern comfort food – I’m here for it. 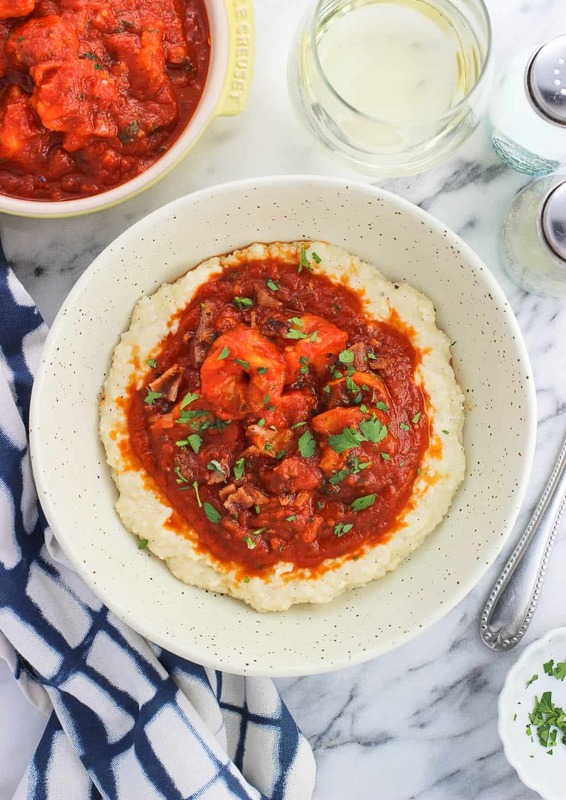 One of my favorite dinnertime tips when it comes to this shrimp fra diavolo and grits is to use quick grits. 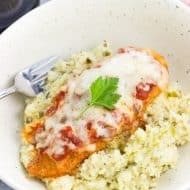 They’re not the pre-cooked instant grits (which I don’t recommend using for flavor/texture’s sake), but are instead a more finely-ground version of stone-ground grits. 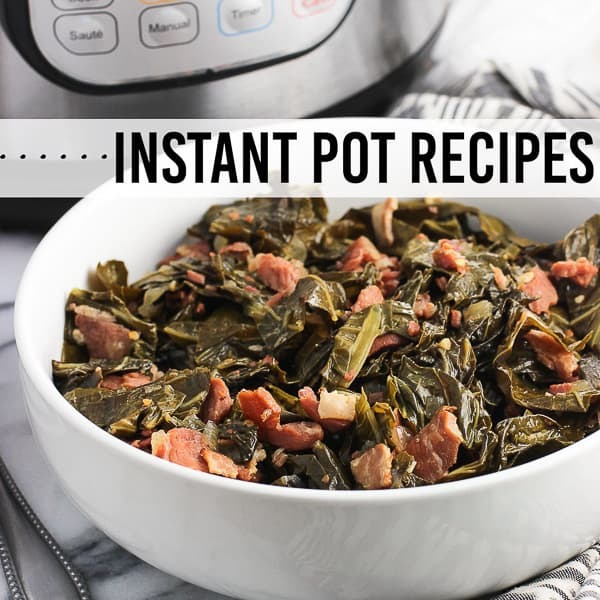 They just cook in less time, which can be time-saving strategy that comes in handy at mealtime. I’d be remiss if I didn’t include my usual seafood PSA when sharing a shrimp recipe: buy frozen! Most of the seafood in the supermarket seafood department was previously frozen and allowed to thaw in the case. While this means you don’t have to go through the thawing process at home, you’re forced to make whatever it is that day. 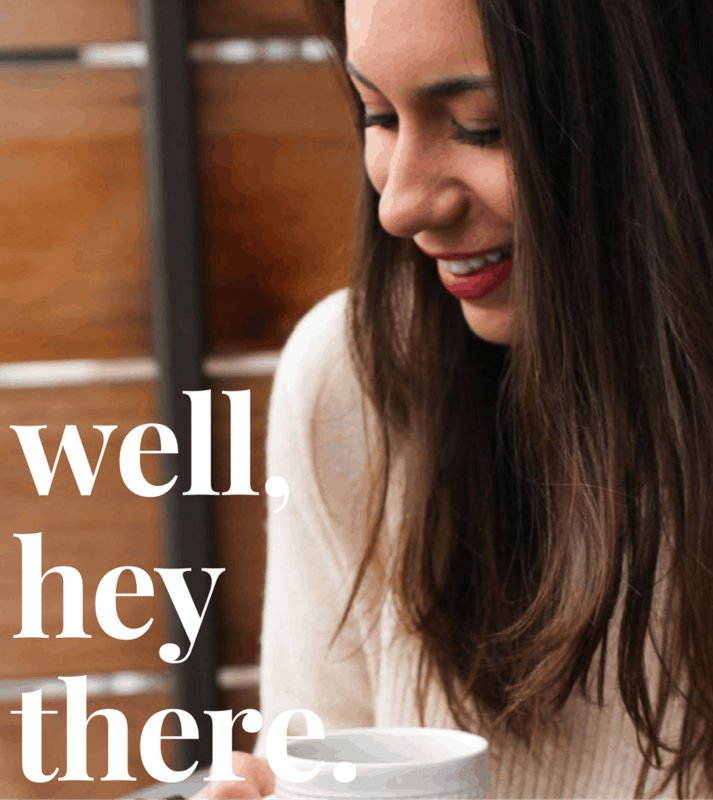 That may not be an issue, but for someone like me who has a tendency for making last-minute meal changes, it throws a wrench in that free and easy mindset. Instead I like to buy large shell-on, tail-on frozen shrimp. 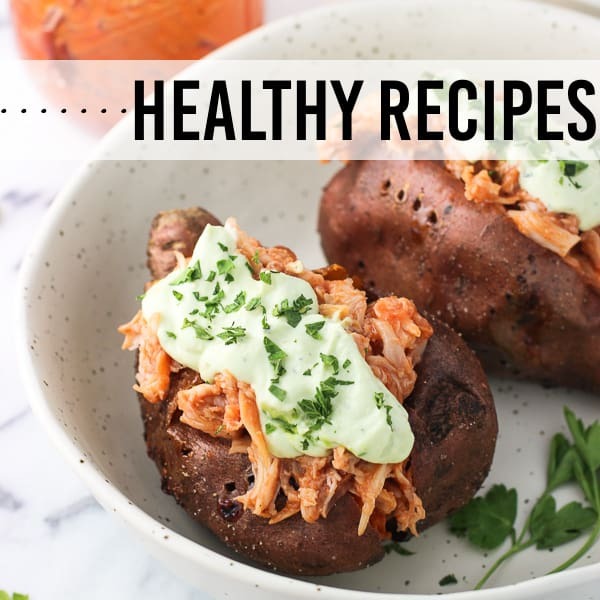 That way you have a lot more flexibility when it comes to cooking with them, and you can purchase them when they’re on sale and save them for when you’re ready. 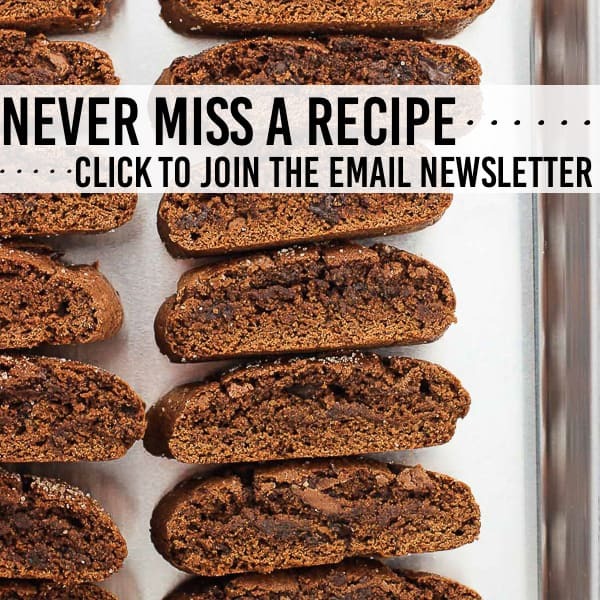 They don’t take long at all to thaw – either overnight in the fridge, or a speedy way I use is placing them in a large bowl in the sink and running cold water over them for ten or fifteen minutes, or until they’re pliable and I can peel the shells. 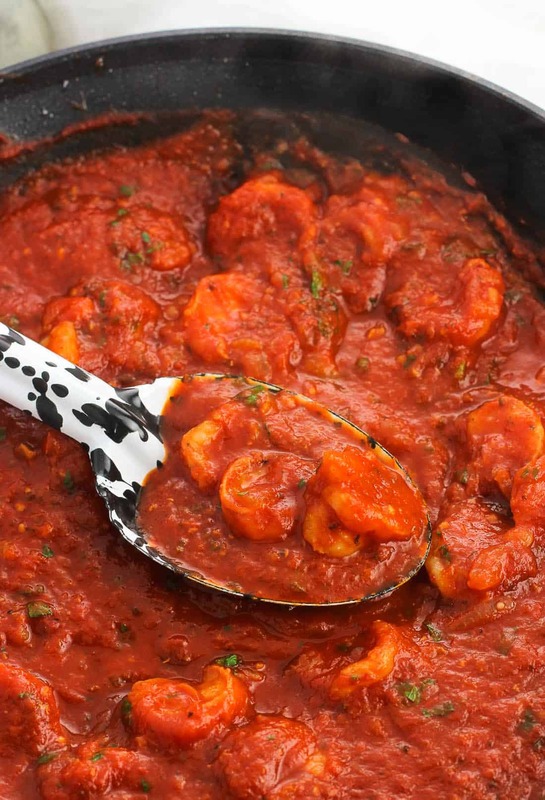 As written below, using a full 28-oz can of crushed tomatoes makes this shrimp fra diavolo and grits pretty saucy. You can use less if you like. You don’t need to use anything fancy when it comes to the wine, just a dry variety like Sauvignon Blanc or Chardonnay. You can prepare the grits any way you wish – using all water, all broth, half broth/half milk, etc. I prefer half broth/half milk as the broth gives them a little extra flavor while being creamy (but not too creamy) from the milk. 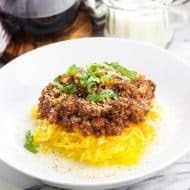 You can use your favorite grated or shredded hard Italian cheese here. I’m partial to Pecorino Romano! You may wish to use less cheese than what the recipe below calls for if your cheese is stronger. Add chicken broth and milk to a medium saucepan and bring to a boil. Add quick grits, salt, and pepper and stir. Once the mixture comes back to a boil, reduce heat to low and cover. Cook for five minutes, stirring every now and then, and then add Parmesan. Stir until it's melted and combined. Keep warm while you prepare the shrimp and stir occasionally. Add bacon to a large skillet set over low-medium heat. Let the bacon cook, flipping the slices as needed, until fully cooked. Remove bacon to a separate, paper towel-lined plate. Remove all but about 2 tbsp of the bacon grease from the skillet and set it over medium-high heat. Then add shrimp in a single layer, cooking 1-2 minutes on each side, until the shrimp is pink, no longer translucent, and curled. Remove cooked shrimp to a separate plate. Next add onion and garlic to the skillet set over medium heat and cook in the remaining bacon grease for 5-6 minutes, stirring around regularly, until the onion is golden and has softened. Pour white wine into the skillet and scrape up all of the onion and garlic from the bottom of the pan. Let cook for a minute, and then add crushed tomatoes, crushed red pepper flakes, salt, and oregano. Stir and reduce heat to low-medium. Let sauce simmer for about 10-15 minutes, or until thickened until your liking. Once thickened, add shrimp to the sauce and stir to coat. Cook for a few minutes to heat shrimp. Serve the shrimp fra diavolo over grits and garnish with fresh parsley. 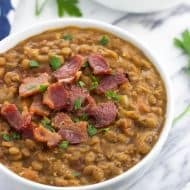 Quick grits are not the same as instant! 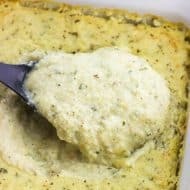 Quick grits takes a few minutes to cook and (in my opinion) taste better than instant.